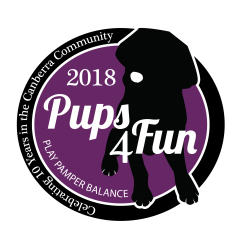 Dogs are picked up from home in our Pups mobile between 7:30 – 9:30am and taken to our daily walk location in different areas of Canberra. The dogs will have a one hour walk on lead as a group, where they practice leash walking manners, walking with other dogs and impulse control. After the walk the dogs go to Pups Park, our privately owned park which was designed specifically for dogs! 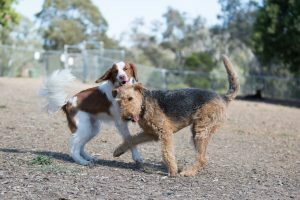 Here we provide off leash play and fun in a controlled and safe area. The park includes lots of fun equipment and toys to keep all the dogs happy, no matter their choice of fun! After the dog park the dogs are all dropped home between 12-1:30pm tired and happy and ready for a big rest. Our playgroups are suitable for sociable dogs of all shapes and sizes. 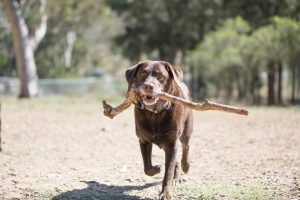 While we don’t specifically train each dog to have leash manners, its often something they pick up from other dogs in the group so we can work with most on lead issues. Please contact us if you would like more information about our playgroups.